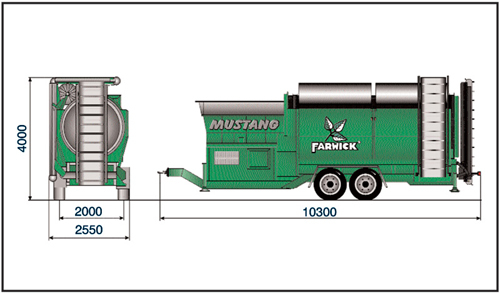 Whether non-recyclable wastes, compost, sand or wood - the MUSTANG can screen everything. Currently most powerful mobile screening machine - designed as tandem center-axle trailer. Throughput up to 160 m³ due to 30 m² of effective screening surface. The innovation: large bunker for constant operation is moved into the trommel during transport - resulting in an overall length of only 10.3 m.
Large load capacity due to secure standing on three supports, robust frame and motor protection system. High operation convenience due to continuous rotational speed of the trommel and the hopper belt with hydraulic straight-discharge control, as well as hydraulically foldable and extendable discharge belts. Optimum maintenance due to extractable drive unit and easy access to all systems. 2 working steps in one operation with the Mustang integral option: combination of screening machine and compact contaminant separator.